Species' geographical distributions are tracking latitudinal and elevational surface temperature gradients under global climate change. To evaluate the opportunities to track these gradients across space, we provide a first baseline assessment of the steepness of these gradients for the world's terrestrial birds. Within the breeding ranges of 9,014 bird species, we characterized the spatial gradients in temperature along latitude and elevation for all and a subset of bird species, respectively. We summarized these temperature gradients globally for threatened and non-threatened species and determined how their steepness varied based on species' geography (range size, shape, and orientation) and projected changes in temperature under climate change. Elevational temperature gradients were steepest for species in Africa, western North and South America, and central Asia and shallowest in Australasia, insular IndoMalaya, and the Neotropical lowlands. Latitudinal temperature gradients were steepest for extratropical species, especially in the Northern Hemisphere. Threatened species had shallower elevational gradients whereas latitudinal gradients differed little between threatened and non-threatened species. The strength of elevational gradients was positively correlated with projected changes in temperature. For latitudinal gradients, this relationship only held for extratropical species. The strength of latitudinal gradients was better predicted by species' geography, but primarily for extratropical species. Our findings suggest threatened species are associated with shallower elevational temperature gradients, whereas steep latitudinal gradients are most prevalent outside the tropics where fewer bird species occur year-round. Future modeling and mitigation efforts would benefit from the development of finer grain distributional data to ascertain how these gradients are structured within species' ranges, how and why these gradients vary among species, and the capacity of species to utilize these gradients under climate change. There was strong geographic variation in the steepness of elevational temperature gradients (Figure 3). When considering the combined effects of elevational extent and elevational evenness with tropospheric lapse rate, the strongest gradients were found for species located in Africa, the western part of North and South America, and the Tibetan Plateau region. In contrast, species in Australasia, the islands of IndoMalaya and the lowlands of the Neotropics had the weakest elevational temperature gradients (Figure 3). 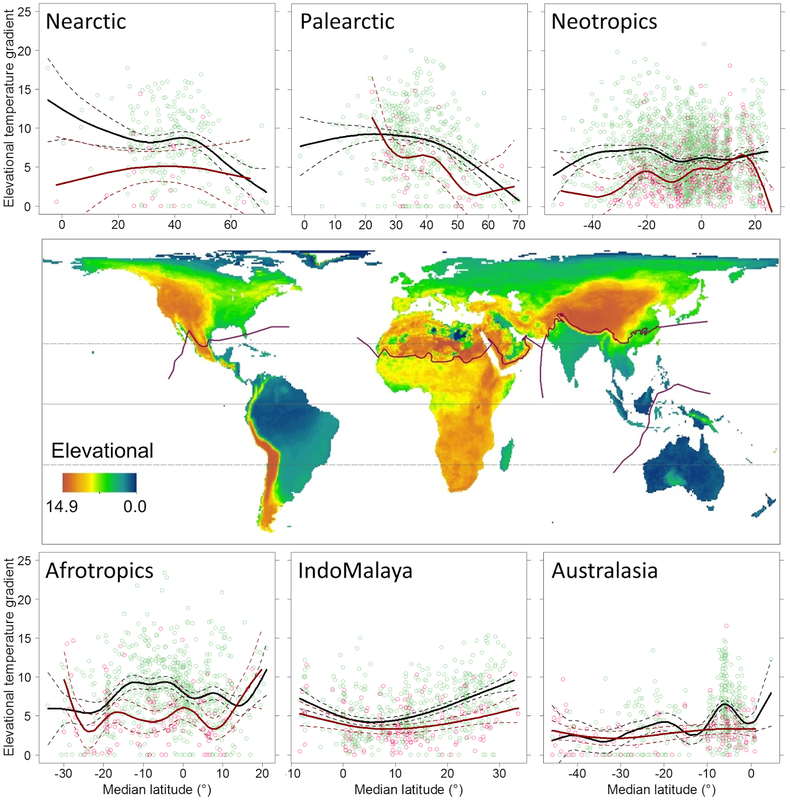 Threatened species were associated with weaker elevational temperature gradients across the six biogeographical realms, with the most significant differences occurring in the Neotropics and Afrotropics (Figure 3). The elevation temperature gradient index summarized across species' geographic ranges (map) and summarized within six biogeographical realms (plots) as a function of the median latitude of each species' range. The temperature gradient was estimated spatially within species' current ranges (see Materials and Methods for details). In the plots, red points are threatened species (n = 766) and green points are non-threated species (n = 4,212). Trend lines are the fits of generalized additive models for threatened (red) and non-threatened species (black). The solid line is the equator and the dashed lines are the Tropics of Cancer and Capricorn (23.5°N and 23.5°S latitude, respectively). The availability of opportunities for geographic responses under climate change reflects the interplay between each species' geographic distribution and their associated latitudinal and elevational temperature gradients (with the extent to which these opportunities will be utilized depending on each species' dispersal abilities and the consequences of changing gene flow). The distribution of these gradients across the world follows clearly defined geographic patterns, but their availability depends on how they intersect with species' distributions. The location, size, and shape of species' geographic range and projected changes in temperature all contain a degree of relevance in determining the strength of these temperature gradients. However, the strength of latitudinal and elevational temperature gradients varied considerably among species, constraining our ability to make robust predictions for all regions globally. Nevertheless, we found that species that are currently at risk of extinction are consistently at the greatest disadvantage, especially based on the availability of elevational temperature gradients.